In this lesson you will discover two new keys: G and H.
As you have noticed, these two keys are placed between your index fingers, once your hands are in the basic position. For pressing these new keys you will have to displace index finger, press the key, and then, return the finger to the original position. To see an example, after pressing G key you should move back the finger to rest on the F key, and, after pressing H key your finger should rest back on J key. 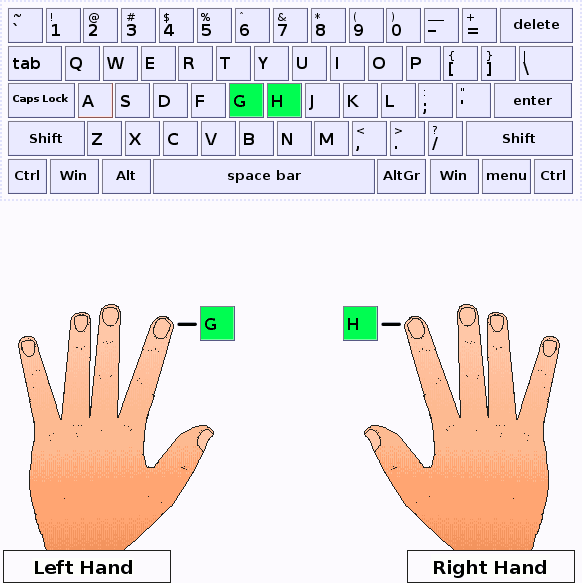 Remember: for this typing lesson, as for every other lesson on this typing tutor, you should maintain the basic hand positioning after pressing each key, and moving only the right finger for the right key, keeping the others on that basic position.